TURQUIE - Izmir - İzmir’s ancient Agora will be surrounded by three-meter-high and 810-meter-long city walls for the purpose of protection. The walls will also enable visitors to spend more time in the area. Because it is a first degree archaeological site, the excavation for the project will be at the lowest level. 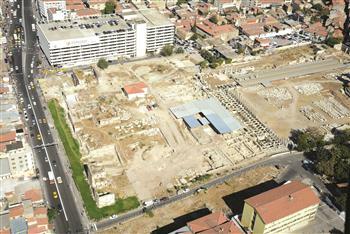 The agora of Smyrna was built during the Hellenistic era at the base of Pagos Hill, the highest hill in ancient İzmir. It was the commercial, judicial and political nucleus of the ancient city. After a destructive earthquake in 178 AD, Smyrna was rebuilt in the Roman period and used until the Byzantine period. ROYAUME UNI – Philiphaugh - The remains of a medieval village in the Borders have been uncovered during the laying of a new water main. Scottish Water was carrying out the works at Philiphaugh on the outskirts of Selkirk. Initial studies suggested it was an Anglo-Saxon settlement, but closer inspection indicated it may have been the site of a medieval village. Archaeologists found evidence of a number of stone buildings with stone floors across the entire area, with cobbled sections in between. It is over a sizeable area - which suggests there may have been a settlement on the site rather than an individual farm building. Scottish Borders Council's archaeologist Chris Bowles said it was an exciting discovery. "We knew there had been something there, we just didn't know where it was," he said. "Now we have the village, and it is quite an extensive village. "We have got a really extensive area of maybe half a kilometre where we have had buildings right along the road running to the salmon viewing centre. "It is not every day that medieval villages are found - most of them are known, this one was completely unknown." Mr Bowles said the artefacts found on the site would now be taken away and examined more closely. Carbon dating will be used to try to give a more precise timeframe for when the settlement was inhabited. ROYAUME UNI – Leicester - Researchers last week developed DNA evidence to help identify the remains of a skeleton found under a parking lot in Leicester, England, as those of Richard III, the last English king to die in battle, in 1485. But the researchers’ work is only half-done. They have made a strong but not conclusive link through the female line, and are now turning to the male side for corroboration. The Leicester team plans to investigate the paternal DNA of the remains. Kevin Schürer, a historian at the university, has already found four living descendants of John of Gaunt, the son of Edward III, who was Richard III’s great-great-grandfather. Dr. King has found that their Y chromosome, which is carried only by men, match, establishing that they are all true descendants of John of Gaunt. The Y chromosome DNA from the skeleton is very degraded, but Dr. King said she had found that she could amplify it and hopes to get enough to make a match with the living descendants. 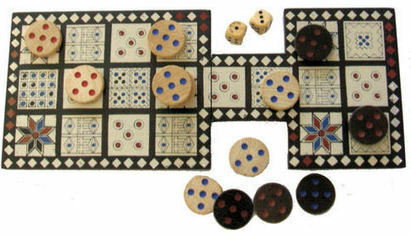 IRAQ – Ur - In 1926-27, the British archeologist Leonard Woolley, while excavating in the royal tombs of Sumer (modern Iraq), discovered four game boards and a number of playing pieces. The tombs were in the city of Ur (in red on the map on the left), once the capital of Sumer about 2500 B.C., and the legendary home of the Biblical Abraham. This area is in the “fertile crescent”, south of Baghdad and Babylon. There are many references to Woolley’s discovery, complete with a number of colourful photographs such as the one below. Woolley’s finds are now held by the British Museum. It appears to be a game for two players who alternate their moves on the board. Various markings on the board (such as the “rosettes”) appear to have had some consequence in the play of the game if a piece lands on one of these squares – sort of like in a contemporary board game – “loose one turn”, “go back three spaces”, etc. MEXIQUE – - Over 5, 000 Mexican antiquities, which were seized in the United States and Germany and returned to the country, are now analyzed and classified by the National Institute of Anthropology and History (INAH). Many of the ancient vestiges show the life of the hunter-gatherer groups, particularly those who lived northwest Mexico. Specialists currently work on cataloging and macroscopically analyzing each of these pieces, from which they can elucidate manufacturing techniques, cultural affiliations and temporalities of the groups. The detailed record is expected to be completed by mid-year.